Edward Teach, popularly known as “Blackbeard” (because he had, believe it or not, a black beard), has a mysterious background. We’re still not entirely sure when or where he was born, nor even his real name for that matter. What we do know is that by 1716 Blackbeard had taken command of his own sloop and was enthusiastically pilfering things like treasure, dry goods, and, perhaps least surprisingly for a legendary pirate, booze throughout the West Indies. By the height of his notorious career Blackbeard’s flagship, Queen Anne's Revenge, was outfitted with 40 cannons and capable of taking on even the best armed merchant and naval ships in the sea. An imposing figure, Blackbeard relied on intimidation to instill fear in his enemies -- he was known to fight with lit fuses sticking out from under his hat. Hearteningly, there is no record of our antihero ever having murdered his captives, but still, stealing everything that isn’t nailed down is not a good way to make friends. Lieutenant Robert Maynard set out to undo Blackbeard in 1718. He successfully ambushed the pirate, only narrowly defeating him after losing a third of his men in a single cannon barrage. In death Blackbeard lived up to his fearsome reputation, having been shot 5 times and slashed about 20 before succumbing. Only his head was kept, with his skull later having been turned into a chalice. Pay homage to this brutal raider with our detailed Blackbeard Costume. 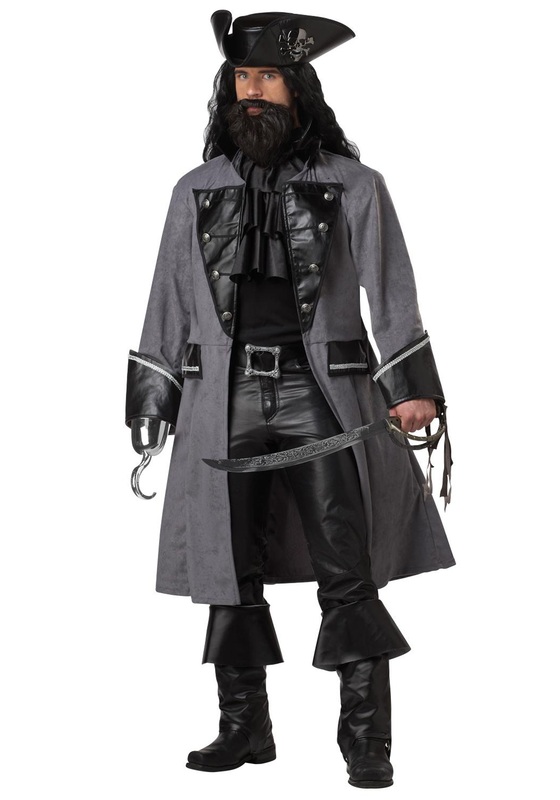 His coat, belt, hat, and jabot are the foundation for the marauder’s signature look and are all included here. All you’ll need is a sword, bottle of rum, pants, boots, and wanton disregard for human life and you’ll be ready to start your own legend!